Make a statement when you drive, and make cycling safer at the same time. 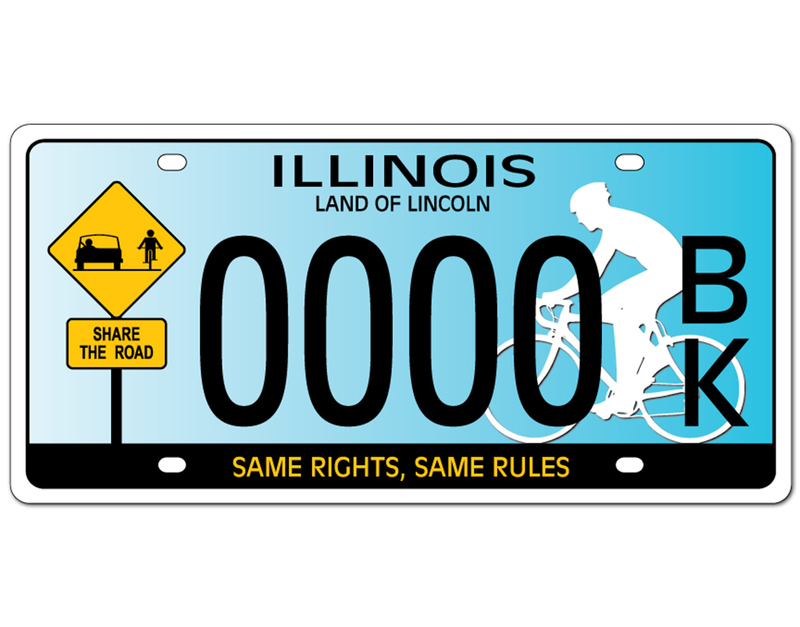 The Share the Road license plates deliver a key message while raising money for Ride Illinois’s safety education efforts through the state’s Share the Road Fund. To order plates for your car, van, or light truck, visit the Secretary of State’s Share the Road license plates page. For a 4-digit random number plate, download the brochure and order by mail. For a personalized or vanity plate, order online using the site’s Pick-a-Plate option. Note that personalized or vanity plates take longer to ship than random number plates, since the former have to be individually made. New customers of random number plates pay $51, plus your normal vehicle registration renewal fee, if within 90 days of expiration. This includes $34 for the Secretary of State and $17 for the Share the Road Fund. Each year afterwards, the Secretary of State will automatically send you a renewal form for your Share the Road plates, like they do now for your regular plates, but with an incremental $22 fee over your vehicle registration renewal fee. Of that $22, $2 goes to the Secretary of State, $20 goes to the Share the Road Fund. If you order personalized or vanity plates, these incremental fees – specifically, the amount going to the Secretary of State – will be higher.